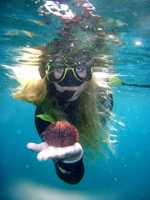 Enjoy the beauty of the underwater world by joining us on a snorkeling excursion. We drive up to a beautiful bay in Puerto del Carmen where you will discover a rich marine life along the rocks. 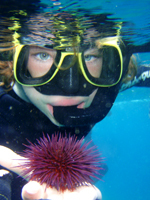 Every snorkeler will be equipped with mask, snorkel, fins and a dive suit so you can stay in the water without getting cold. 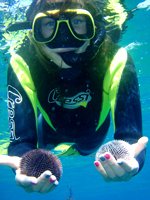 The snorkel safari is for beginners as well as for advanced and makes an ideal excursion for families and groups. There is an instructor with you all the time to assure your safety.